"Rural crime cost UK famers £50 million in 2010", according to a survey conducted by NFU Mutual, up 17% on 2009! 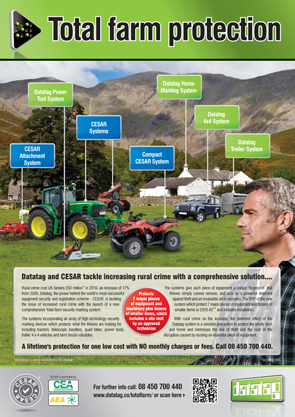 Datatag, the power behind the world’s most successful equipment security and registration scheme - CESAR, is helping Farmers tackle the menace of increased rural crime with the launch of a new comprehensive ‘Total - Farm Protection marking system’. 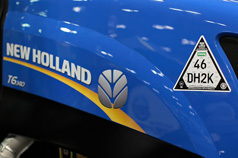 The new system incorporates an array of high technology security marking devices, including Radio-frequency identification (RFID) transponders, forensic liquid DNA, microscopic Datadots® and UV stealth etching technology, which combine seamlessly to identify and protect the assets that thieves are targeting, including tractors, telescopic handlers, quad bikes, power tools, trailer, 4 x 4 vehicles and farm house valuables. The Datatag system gives each piece of equipment a unique ‘fingerprint’ that thieves simply cannot remove, providing a powerful deterrent against theft and an invaluable aid in recovery. 1 Datatag power tool system for marking up to 25 individual power tools and attachments. The recommended retail price (RRP) of the new system is only £929.40 (excluding VAT). The price includes on-site installation by a trained CRB vetted technician. The Datatag Total Farm Protection marking system is convenient to install with a minimum of fuss. Datatag has a network of fully trained and CRB checked installers across the UK who can quickly protect a farm and family home. Proof of ownership and the original registration documents are required for vehicles protected under the CESAR scheme. CESAR, the only official UK equipment security and registration scheme, became the most successful and widely used scheme in the world at the turn of the year after achieving 15,000 registrations in 2010 taking the cumulative figure to 40,000. Now, just 7 months later, CESAR has achieved another 20,000 registrations, bringing the total number of machine registrations in excess of 60,000 so far! With rural crime on the increase, the deterrent effect of the Datatag system is a sensible precaution to protect the farm and family home and a sound business decision to minimise the risk of theft and the cost of the disruption caused by loosing an essential piece of equipment. Elements of the Total Farm Protection marking system will attract significant insurance discounts with many agricultural insurers, all of whom recognise the benefits of installing CESAR and Datatag as part of a Farms anti-theft strategy. Can you afford to delay? Order your Total Farm Protection System now direct from any of our participating Installers and protect your farm and equipment TODAY! The Datatag Total Farm Protection systems are available at significant discounts via a number of Agricultural Membership Associations, Cooperatives and Unions. Contact your Association now to order your Total Farm Protection System DIRECT and save hundreds of pounds TODAY! The Datatag systems incorporating an array of high technology security marking devices which can protect 4 x 4 vehicles, power and small tools, trailers, farm house valuables plus much more.. The CESAR systems incorporating an array of high technology security marking devices which can protect tractors, telescopic handlers, combine harvesters, quad bikes, machinery attachments plus much more..